This year the story wisely ditches the scattered, anti-protagonist narrative that marred Modern Warfare 2 in favor of flashbacks told through the eyes of Alex Mason, a stoic and ultimately flat character. Although voice cameos by Ice Cube and Ed Harris go a long way towards spicing up the banter, Sam Worthington just can't get anywhere as Mason. The month of March is expected to be a bad one for the videogame industry and it's all the fault of the Call of Duty franchise. Okay, so it's probably not "all" CoD's fault, but the inability of Modern Warfare 3, the most recent addition to the series, to maintain long-term sales is having a big impact on the industry as a whole. That's the opinion of PiperJaffray analyst Michael Olson, who predicts that Modern Warfare 3 isn't going to have the same "long tail" as its predecessor, Call of Duty: Black Ops. 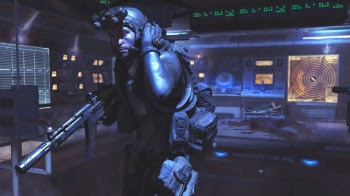 Black Ops was the fifth-best-selling title in March 2011 but Modern Warfare 3 is expected to be only the eighth-best-seller, with less than half the sales for the same month in 2012. The real bad news for the industry, if Olson is correct, is that it's not an isolated Call of Duty phenomenon. "We believe big name titles are no longer able to sustain 'fat tails'," he said. "This 'thinning tail' phenomenon is driven by, one, casual gamers leaving the market, two, a steeper pre-sale and up-front curve, and three, cannibalization from the pre-owned market." But for right now, Modern Warfare's failure to pull its weight is a big reason why March is expected to be an ugly month for videogame sales. Olson predicts the NPD Group will report a year-over-year decline in software revenues of 26 percent, a nasty drop that's pretty much in line with similar predictions from analysts Michael Pachter, Doug Creutz and Arvind Bhatia, who collectively expect a slide of anywhere from 22 to 30 percent.